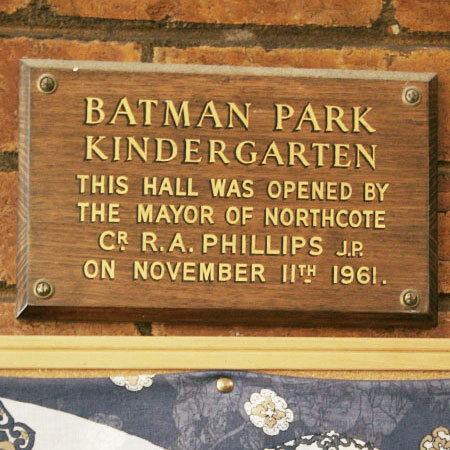 Batman Park Kindergarten has been an important part of the Northcote community for generations. The kindergarten is ideally located within the local community park and is easily accessible by tram, bus and train. As a two-room kindergarten, we are one of a diminishing number of kindergartens who continue to offer both three-year-old and four-year-old programs. We offer both three-year-old prekindergarten and funded four-year-old sessions, providing a nurturing and stimulating environment that gives children and families a positive first experience of education. Our kindergarten is managed by parents in an elected Committee of Management. 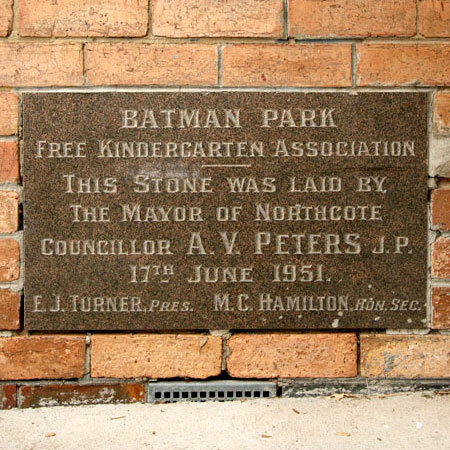 The Batman Park Free Kindergarten Association was established in 1945 — the culmination of years of effort by members of the local community. Led by President, Mrs G. Turner, and Secretary, Mrs M. Hamilton, the association began fundraising for the kindergarten’s construction, and succeeded in raising over £4000. In 1951, a person who wished to remain anonymous donated sufficient cement for the kindergarten to be built, and the foundation stone was laid by Northcote Mayor Cr A. V. Peters on 17 June 1951. Built to accommodate 30 children at a cost of about £7000, Batman Park Free Kindergarten offered kindergarten sessions for four-year-old children as well as afternoon play groups for younger children. The official opening by Northcote Mayor Cr T. F. Walsh was held on 27 April 1952 and was attended by Victorian Labor leader and member for Jika Jika, Mr John Cain. 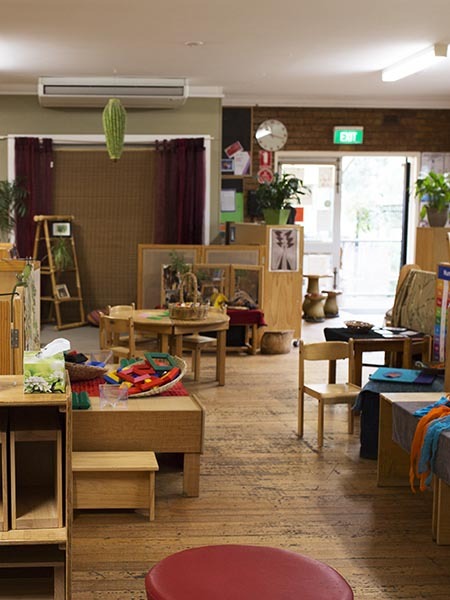 In 2010, our kindergarten offered additional sessions by extending into the adjacent hall, originally a kindergarten building and opened by Northcote Mayor Cr R.A Phillips on 11 November 1961. The hall was later used for Darebin community groups. 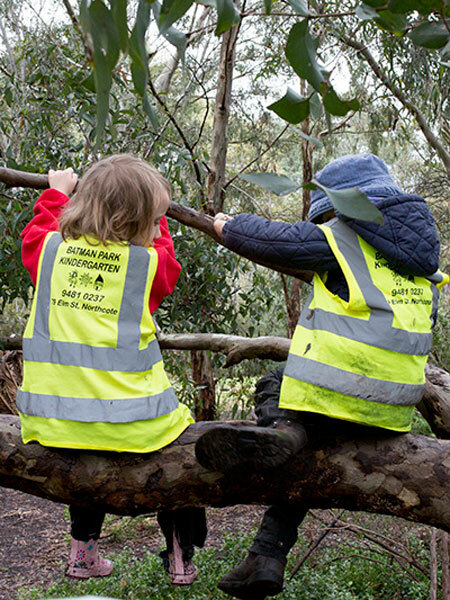 By responding to the increased demand for kindergarten places in Darebin, we were able to welcome 45 more families into the Batman Park Kindergarten community. Today, we have 12 wonderful educators providing quality education and care to 84 children in our four-year-old kindergarten program and 60 children in our three-year-old program. Kindergarten for Northcote. (1951, June 18). The Age, page 2. Retrieved from Trove, National Library of Australia. New Kindergarten. (1952, March 4). The Age, p. 7. Retrieved from Trove, National Library of Australia. Out of the mouths. (1952, April 28). The Argus, p. 5. Retrieved from Trove, National Library of Australia. The National Quality Framework was established in 2012 as a way to assess the quality of kindergartens/preschools, long day care, family day care and outside school hours care services and to drive continuous improvement. All Victorian providers undergo detailed reviews by the Department of Education and Training where their performance is assessed against the seven quality areas of the National Quality Standard and given an overall rating based on these results. Our kindergarten had its first ever assessment in August/September 2015, including a review of our Quality Improvement Plan (QIP – our goals for improving), observation of Educators, interviews with Educators and committee members and review of key information. We are proud to report that we achieved an Exceeding National Quality Standard rating for all seven quality areas and an overall rating of Exceeding National Quality Standard, which is the highest possible rating. Batman Park Kindergarten is administered and managed by a volunteer Committee of Management. Under our constitution, we are required to have at least 14 members consisting of four executives and 10 active ordinary members. We are required to have a President, Vice-President, Treasurer, Secretary and at least ten ordinary members. The Committee of Management is responsible for the overall management of the kindergarten, particularly the finances and the administration. The Committee of Management works in close consultation with the Director and Educators. Some of the tasks undertaken by the committee include reviewing current policies, an annual quality assurance review, allocation of funds, enrolments, timetabling of sessions, writing the newsletter, and organising working bees and social events. Without volunteers, the kindergarten cannot function, so please consider participating where possible. Being a committee member is a rewarding and interesting challenge, which allows you to contribute in an important and meaningful way to the quality of your child’s kindergarten experience.